Severalnines ClusterControl v1.2 introduces support for MongoDB sharded clusters, as well as a new simple and user-friendly interface, with ability to provision clusters directly from the ClusterControl interface. Document-oriented storage - JSON-style documents with dynamic schemas. Full index support - Index on any attribute. Replication & high availability - Mirror across LANs and WANs. Querying - Rich, document-based queries. Fast in-place updates - Atomic modifiers. Map/Reduce - Flexible aggregation and data processing. GridFS - Store files of any size. By the way, we will cover MongoDB in a separate post. User management module to provision and manage users. This allows Administrators to grant access to the ClusterControl application to departmental users or other organizations. The basic idea behind using the new UI for distributed monitoring is that you do not pump all monitoring data produced by your clusters into one centralized monitoring database, but rather leave it in each ClusterControl server’s monitoring database. What is centralized is the visualization. The UI retrieves live data from the individual clusters on-demand via a REST API and merges it into one logical view. It scales very well to a large number of clusters. No inter-site network traffic is generated at all during the actual monitoring. No central storage is needed. We believe this new release will increase the efficiency in managing and monitoring your database clusters. Need to deploy a database cluster but don’t want to spend hours typing in commands? Looking for an easy way to manage and monitor your cluster? 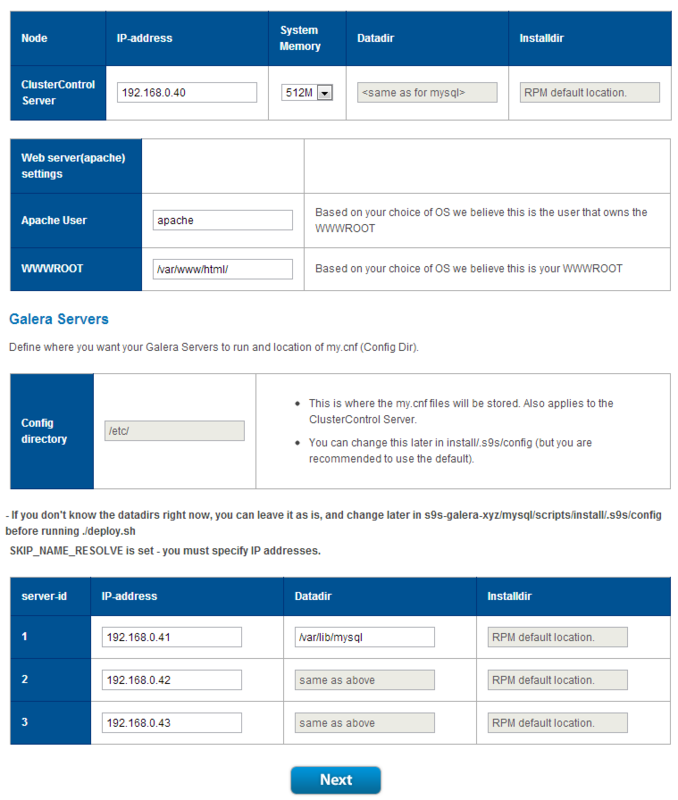 Welcome to ClusterControl - it will help you deploy, manage, monitor and scale your cluster. The installation steps might vary depending on the operating system you use. Step 2: On the configurator page, choose Codership (based on MySQL 5.5) as screenshot below and click Next. Codership is the developer for replication and clustering solution for MySQL. They release the MySQL Galera patches based on MySQL 5.5 by Oracle. Notes: You may need to enter the root password for prompted host because at this moment, passwordless SSH not being setup yet. Step 4: The deployment will start automatically. Grab a cup of coffee and get back to the server later. It should be ready within 10 minutes to 30 minutes depending on the host performance and internet connection. Open your browser to http://<hostname_of_this_computer>/cmonapi to register you cluster. Enter this ClusterControl API token: 22a1fff53d6888c219c731895c8ae725e889c6eb when prompted. Step 1: Lets open ClusterControl at https://192.168.0.40/clustercontrol. Login using your registered email address during the configuration of deployment script with default password “admin”. Step 3: You will be redirected to a page which requires you to insert your API key and the address to the ClusterControl API. ClusterControl API address will be https://[ip_address]/cmonapi. Step 4: At this point, we have registered our Galera cluster with the UI. You are done! You have now deployed a production-ready Galera Cluster for MySQL together with its management and monitoring tools.